This type of wood features the special property that the wood is completely self-insulating, which means that no insulators are needed and that the post is extremely durable. Some Insultimber fences have been installed more than 30 years ago and still function as fences to keep livestock in or wild animals out! Insultimber is a completely natural product, without the addition of any environmentally harmful impregnation agents. The commercial exploitation is kept under strict control: a special forestry plan is operated to prevent damage to the nature and regulate planting. The post blends perfectly into the landscape. The pasts are covered by a 10 year guarantee. That means that you don’t need to use insulators, and the fence wire is fastened to the post with the connection wire. The Plastic Eco post consists of 100% recycled material (polypropylene). This material and the cross-shape ensure cast iron quality. The cross-shape also ensures the post stands firmly in the ground. You do not need any additional insulators to attach the wire. Just use fixing wire or clips. There are pre-drilled holes at the usual wire spacings and they have a 10 year guarantee. A Plastic Post, made from 100% single source, recycled material (polypropylene). The material together with the cross shaped section, guarantees the strength of the post. No insulators needed. Up to 70% more cost effective that traditional (non-electric) fencing. 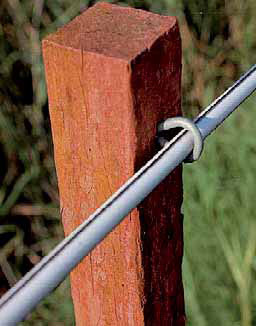 A longlife soft wood post, ideal for permanent fencing. Using these posts gives your fence and 'authentic' look.